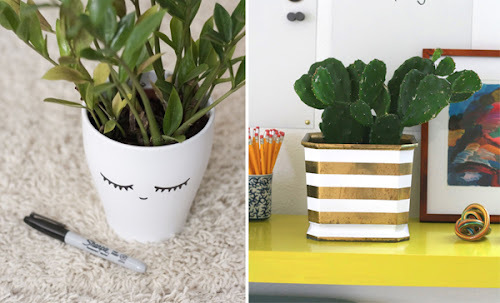 On the subject of house plants, have you seen these sweet tutorials for small pots? Above, tiny polymer clay faceted pots at Merrypad. Face pot at Dream Green DIY and brass pot with spray painted stripes at Little Green Notebook. Cement pots with gold leaf at Ruffled and DIY book planters at Green Wedding Shoes. 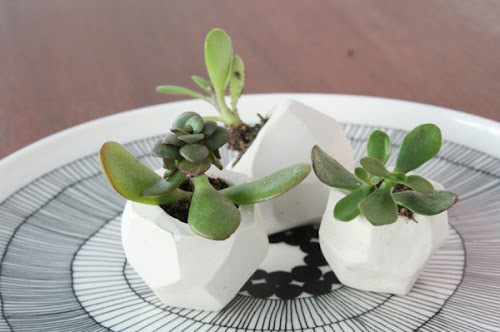 Those polymer clay faceted pots from the Merrypad site are awesome and they seem so easy! Thanks for sharing! Um...... TOO CUTE! Are you kidding me? I am going to have to make the little faceted clay ones (I bought a LOT of clay when my local Michaels was having a big clearance sale due to renovation) and the kitty ones...!! There are so many possibilities with the DIY plastic one--bear, fox, oink oink pig...! You could make a whole farm or forest of them. A great way to get them into kids' rooms, or get kids interested? Lovely work, Rachel! And glad to hear an update on your little plants!